Many people believe that scoliosis has to slow them down, that they have to stop exercising or playing sports simply because of a diagnosis of scoliosis. But a scoliosis workout can actually help to improve your scoliosis, as well as your general health and happiness. That said, we do recommend you get a doctor’s opinion on potentially harmful activities before engaging in them. We put together a list of frequently asked questions about scoliosis workouts and their corresponding answers. Q: What benefits are there to staying active if I have scoliosis? A: Scoliosis progresses when discs in the spine collapse and cause the spine to curve in a different direction. A common reaction to this information is to limit any exercise. However, movement helps with the regeneration of spinal discs. The regeneration of collapsed spinal discs is the main goal for many scoliosis treatments. The discs need moisture to regenerate, and the best way to send moisture that direction is through staying active. Keeping active will also benefit your social wellbeing and general health. There’s no need to stop exercising because of a diagnosis of scoliosis. Talk to your doctor to find a safe and healthy scoliosis workout for you. Q: Are there risks to working out with scoliosis? A: Considering the delicate and intricate nature of scoliosis as a disease, there are risks to performing certain exercises or playing certain sports. For example, collision sports like hockey and football won’t carry many doctor recommendations, whereas swimming is often recommended by chiropractors. However, every patient is different. There is no be-all-end-all answer to what you can and can’t do with your specific scoliosis. Having an honest conversation with your doctor is the only way to discover your personal risks for each activity you’d like to do. Q: What precautions should I take for a scoliosis workout? A: In order for sports and exercise to be safe, you should be completely complying with your treatment and following your doctor’s advice. Try to maintain good posture and proper deep breathing throughout your workout. If at any point an exercise becomes painful, you should stop immediately. Be sure to discuss all sports and exercises with your doctor beforehand to avoid any potential pain or injury. Q: If I have scoliosis and my spine is still growing, can I play sports? A: For growing spines, the list of scoliosis-safe activities is a little less extensive. Whereas adults are advised to exercise caution when playing collision or competitive sports, these sports can be detrimental to children with scoliosis. However, some sports are great for growing spines. Cycling on paved surfaces, hiking, skating, dancing, swimming, badminton, and yoga are all safe activities. Talk to your doctor for more recommendations. Q: Which sports are best for scoliosis? In general, activities that don’t involve collision or purely one-sided motions are excellent options for scoliosis patients. Be sure to discuss any activities with your doctor before you begin just to make sure it’s a good fit for you. Q: Which sports are worst for scoliosis? A: In general, collision sports, like lacrosse and gymnastics, and rotation-heavy sports, like golf or tennis, are most likely to injure the spine or reduce the effectiveness of treatment. Repetitive and compressive activities, like horseback riding or weight lifting, and sports that carry the risk of spinal trauma, like martial arts and downhill skiing, can also be dangerous. However, this doesn’t necessarily mean that you have to stop these activities. As a rule, you should discuss the pros and cons of each activity with your doctor before your scoliosis workout and stop if you encounter any pain. Q: Can I still play collision and competitive sports if I have scoliosis? A: Yes, however, we recommend discussing the risks with your doctor first. 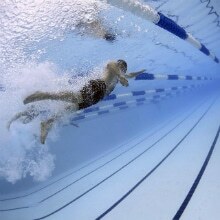 In some cases, collision or competitive sports can negatively impact the curve of your spine. Q: How do you determine whether or not it’s safe to play a particular sport? A: Looking at the motions involved in each activity, doctors can weigh this against each person’s unique brand of scoliosis and speculate what the risks and advantages are. CLEAR doctors are taught biomechanics and how each body movement can affect the spine. For example, a shoulder-heavy workout may not only affect the shoulders, but also the back and hips. There is no set yes or no answer to each sport or activity. Everything is subjective to how important the activity is to you, as well as the risks that activity carries in respect to your scoliosis. Q: Can I exercise and play sports during CLEAR treatment? A: Yes! Talk to your doctor about the specifics beforehand, but CLEAR doctors generally recommend you keep active both during treatment and after you’ve completed it. Q: How long should I wait to play sports after starting CLEAR treatment? A: There are some restrictions for certain sports and activities during CLEAR treatment. We usually ask that you wait 90 days before playing competitive sports and 180 days before playing collision sports. Muscle physiology takes time to develop. We like to stabilize the spinal position before putting it in any sort of compromising position. However, once you are stable and your doctor has given you the green light, there’s no reason you can’t go back to playing your favorite sports. Q: What are some quick and easy exercises I can do at home to help my scoliosis? A: Unfortunately, scoliosis-specific exercises can’t be easily generalized and applied across the board. Chiropractors specializing in scoliosis use three-dimensional x-rays along with a detailed physical examination to learn the intricacies of your unique spine. When you undergo CLEAR treatment, your doctor will give you specific scoliosis exercises personalized to your unique spine. These are usually therapeutic exercises that work to improve your balance and posture. Exercise creates happy and healthy people, and scoliosis should never stand in the way of your happiness. Staying active is actually proven to help improve scoliosis and the irregular spinal curves that it produces. There’s no be all end all yes or no answer to any activity, but there are often pros and cons to specific activities in relation to your unique situation. Work with your doctor to come up with a scoliosis workout routine that works for you and your scoliosis. Do you have any other questions about finding a scoliosis workout that’s right for you? Have you tried working out with scoliosis? We’d love to hear from you in the comments. I’ve been stretching daily since a young girl to nearly 50 years old. Each day is different according to pain level and muscular tension. I have noticed that the feet must be supported in shoes and may require some sort of orthodics to help redistribute weight without problems developing with the knees. I’ve seen 2 excellent chiropractors recently in Michigan and both could not imagine why I am not wearing an orthodic shoe lift to help straighten my spine since my hip is off and was told I have one leg longer than the other. Also, the article notes a repetitive exercise on one side and yet my whole series of exercises are all one sided and have created a muscular deformity and weakness on the opposite side of my body over the last 8 years. With each intensive (3) the exercises have not really changed. I have also noted that the waist trainer exercise twice a day for 15 minutes keeps my body in chronic soreness. I have a handful of times only done my exercise once and my body soreness reduced to a noticeable level. My Mother who is a retired medical massage therapist is convinced that these exercises at this level is causing this chronic soreness without reprieve. Its has become now about pain management at 36 degrees, since at times I can barely move, let alone bend to put on my shoes. Hello. I highly recommend that you schedule a consultation with a CLEAR Certified Chiropractor, as unfortunately we cannot provide medical advice over the Internet. A CLEAR Doctor will be able to review your medical history, perform a complete examination, and take any necessary x-rays in order to have all of the information about your specific case to give you the best possible advice for how to reduce your back pain and improve your posture. You can find a CLEAR Certified Doctor by clicking on the “Find a Doctor” link at the top-middle of the page. I highly recommend you share this information with your scoliosis surgeon, and ask them if the last surgery is necessary in your case. I wish you all the best of health! I’ve recently joined a gym and started some weight training. I do shoulder press and chest press. With the shoulder press, I can barely lift 2kg on the machine, as I find it very difficult to lift with my weak shoulders. I’ve never lifted before. I am fused in my thoracic spine T1 TO T2 and also have moderate lumbar scoliosis. I wanted to ask if it was okay for my to continue weight lifting and if there is anything I should avoid. This is a very interesting topic for me, and I’m glad you asked! My father has 44+ years of clinical experience, and I’ve also worked for a chiropractic clinic specializing in sports rehab & shoulder injuries (they were the official chiropractic clinic for our local baseball team, in fact!). In my experience and in the experiences of these doctors, weightlifters can actually have some of the worst spines and weakest core postural muscles! As certain muscles become very well-developed, the body can start utilizing these stronger muscles preferentially, at the expense of other muscles that are important for good spinal stability & posture. While I can’t provide individual advice or recommendations to anyone without the opportunity to work with them in person, I can tell you that exercises like leg presses, power lifting, and squats can be very bad for a lumbar scoliosis. The body will use the low back muscles on the side of the convexity more than the muscles on the side of the concavity, leading to even more muscle imbalances (and increases in muscle imbalances have been linked to increased risk of progression). If you have a significant scoliosis or muscle imbalance in the thoracic spine, the same thing can apply to pull-ups, push-ups, and shoulder/chest presses. This is why, in my opinion, it is so important for someone with scoliosis to have a spinal exercise program, developed for them by a scoliosis specialist, that involves asymmetrical & isometric exercises. Without such a program, most types of weightlifting activities could potentially result in increased muscle imbalances and lead to worsening of your scoliosis! It is also important to consider the sagittal (front-to-back) curves in the spine; activities like bench presses can worsen the good curves in the neck and upper back, and sit-ups can worsen the good curve in the low back (patients with a loss of curve in their low back should do bicycle kicks with a firm lumbar support instead). I hope this information is helpful! For a more detailed and specific exercise plan, I highly recommend that you consult with a CLEAR doctor or PT specializing in scoliosis rehab. Just a few sessions with them can provide you with exercises and modifications to your athletic routine that can provide a lifetime of benefit! I am 63 years old & have severe scoliosis. I bought the Simply Fit board in December 2017 as seen on Shark Tank. It’s amazing & when I am in severe pain I start working out with it for 5-10 minutes a day & the pain is gone once I am done exercising. I also get epidurals & bike ride but the simply fit board is amazing & sometimes I use 5lb. hand weights while doing it. It is really helping my scoliosis, it really doesn’t hurt as much anymore & I use this exercise board every single day. Try using the Simply Fit Board for Scoliosis pain & better posture. Hello, I have been training for a 10k run -was diagnosed with a slight curvature of the spine at 30 an was told at the time as long as I exercise and keep my weight down,i would not end up in a wheelchair at 70(I am 65)have been running well -treadmill -but for the last month have noticed I am leaning to the left side an have to hold on with my left hand as feeling unbalanced an unsteady . Many common weightlifting & bodybuilding exercises can actually cause scoliosis to get worse. This is because the risk of progression has been linked to imbalances between the muscles on each side of the spine. With scoliosis, the muscles on one side of the spine tend to be stronger, so the body will use these muscles more than the muscles on the other side, causing them to continue to get stronger & stronger, as the other muscles get weaker & weaker. This is why the majority of the CLEAR exercises are asymmetrical exercises, designed to only target the muscles on the weak side of the spine, and reduce the imbalance. You can find more information on our Sports & Activities page. For the best exercise recommendations, tailored to your specific spinal pattern, I would recommend that you reach out to a CLEAR Doctor, so they may review your x-rays & health records and schedule an in-person or phone consultation to go over their recommendations for you. I got diagnosed with scoliosis at 3rd grade and I am now 45. As I’m getting older my pain in my lower back and shoulders have increased by a lot. I’ve tried yoga and I find that all the bending that you have to do with yoga hurts my back even more. So my first question is if yoga does indeed help strengthen my back therefore relieving me from my back pain? I’ve been wanting to try either pure barre or Pilates. Do you think these programs would be by better than yoga? When it comes to yoga, pilates, & other movement therapies, it’s important to recognize that certain maneuvers may be harmful for certain patterns of scoliosis. This could be why you notice flare-ups in your back pain after some sessions. I’d suggest looking into Elise Miller’s Yoga For Scoliosis (www.yogaforscoliosis.com) program. Her instructional videos are very nice, in that they feature three models with different color shirts. Depending upon your scoliosis configuration, you’ll follow along with a different instructor. When it comes to certain exercises or maneuvers that are bad for that particular curve type, your instructor won’t perform those, so you know to skip them. Another program which I am very impressed with is Karena Thek’s ScolioPilates (www.osteopilates.com). Karena has been a guest speaker at our seminars, and her work has been featured on news programs and in children’s hospitals. You can find more information about sports & activities, as well as some helpful stretches & exercises, on our Scoliosis Exercises page. I hope this is helpful! Please let us know if there’s anything else we can do. I was wondering what kind of other exercises could I do at home which do not require any equipment. Is jogging fine? Also is doing squats, side planks and sit ups alright as well? Any help would be really useful. Thank you. Most types of general exercises can be problematic when it comes to scoliosis. Almost all cases of scoliosis are accompanied by imbalances in the muscles along the spine. When you do symmetrical back exercises (planking or squats, for example) the body will preferentially utilize the stronger muscles on one side of the spine. Over time, this can aggravate the muscle imbalance and increase the risk of the scoliosis getting worse. This is why CLEAR recommends a customized plan of asymmetrical back exercises, developed specifically for that patient based upon a review of their x-rays and individual case presentation. This can only be achieved by meeting in-person with a specialist in exercise-based approaches to scoliosis treatment, such as a CLEAR doctor. While we offer some simple, easy general exercises & stretches on our website, the ideal course of action is to consult with a professional to determine exactly which exercises are best for your specific case, and which should be avoided. I’m 14 years old and I have S-shaped curves in my spine ranging from 25-30 degrees. I also wear a back brace daily. I have been taking phys-ed lately and I have to do sit ups. I am pretty healthy and I do exercise often but I can’t even seem to do one sit up. My spine just starts hurting and my whole back tenses up. I have tried putting pressure on my feet and countless other methods for this. Somehow none of these work. Is there any advice you can give me on how I can somehow strengthen my spine so that I can do sit ups? Or is it just not possible? The curves of the spine give the body strength and flexibility. When those curves are lost and the joints become restricted, the muscles may work less effectively. This happens in scoliosis as well; as muscles on one side of the spine become weaker over time, the body begins using the stronger muscles more, and this increases the risk of the scoliosis getting worse. This is one of the reasons why asymmetrical (one-sided) exercises are effective in scoliosis care. It surprises many people to learn that exercises like sit-ups, push-ups, pull-ups, etc, can actually be very bad for your spine & for your scoliosis, because they force out the good curves in your spine and strengthen the wrong muscles. Visit our page on Back Exercises to learn more about exercises that can help your spine maintain its natural, healthy curves. For example, rather than sit-ups, try doing bicycle kicks with your legs in the air, while using a firm foam roll or rolled-up towel to support your spine’s good curves in the neck and low back. Also, a CLEAR chiropractor can perform an exam & take x-rays to prescribe an individualized, specific home exercise program that is customized and ideally suited for you. In just one or two weeks, they can begin to make changes to your spine that will result in measurable improvements in your ranges of motion, strength levels, & endurance, and by doing your prescribed spinal exercises at home on a regular basis, the entire course of your life can be improved for years & years to come. Yes, it is certain sports don’t do well with certain curve patterns/types. In order to make that type of determination, an evaluation of your daughter would be warranted. I would recommend discussing it with her orthopedic.